The spirit of Christmas that resides within the hearts of children is undoubtedly one of the most magical feelings in the world, which is why Catherine Baddeley wrote Farmer Christmas, a winter tale set in the midst of her village home. Farmer Christmas lets children enjoy a bot of countryside festive spirit! ‘Kids say the funniest things’ is how the saying goes, and it is precisely from that anecdote that the idea for Catherine Baddeley’s children’s book came to life. In 2013, after working in Bristol as a town planner, she moved back to Higher Ayshford, the 135-acre family farm in Holcombe Rogus, Devon, to be closer to her family as she started her own, with a hunger to develop a home-grown business. Giving something back to the farm and the community however was always at the forefront of Catherine’s mind. “My parents run the farm and I wanted contribute in some way but I knew it wasn’t going to be in a practical sense like driving tractors. Catherine wrote the bare bones of the story a few years ago, but it wasn’t until she had her first child, Hamish, that the book itself began to take form. While on maternity leave in 2015, Catherine was introduced to Sophie Baugh-Jones, an illustrator who understood Catherine’s vision immediately. The pair set to work, taking the chance to look over their work every time they met – as new Mother’s, they were in the perfect situation to be inspired by their own children and family along with the village they lived in. It’s heart-warmingly clear that this book was born from living life in a small countryside village, full of quirks from long standing characters, the scenery inspired by their surroundings. There is even a small village map beautifully illustrated mid-book too. Each aspect of the process is linked to people that both Catherine and Sophie know, with Catherine’s father, Simon, of course, ensuring all tractor illustrations were completely correct, sitting with Sophie as she drew. “Our website was designed by our friend Tim Greenslade, a sheep farmer who runs a business called The Design Shepherd. His wife also did our photography. “Sophie knew someone in graphic design who put the book together for us. “Then, the book was printed locally in Exeter, which was so nice because we went down and watched the first batch get printed, hot off the press. Self-published and with most sales going directly through their website, they have sold over 2,000 copies of Farmer Christmas so far, with a 1,000 more recently ordered for the run-up to Christmas. The pair mainly supply independent bookstores and farm shops at a retail price of £8.99, but also have a positive relationship with R.A.B.I, a charity that works to financially support farming people of all ages. “It sounds bizzare but we launched our Christmas book this summer at the Mid-Devon show thinking it would create interest for the coming season. “The change we got from the books sold was put in to a R.A.B.I collection box, who were also present at the show. "We’re so proud to support the Royal Agricultural Benevolent Institution (R.A.B.I). We publicise them on our website and at events we attend, and help them raise money through raffles and auctions. We also use our book events to spread the word about the charity’s vital help for farming people in financial difficulty. Since 2015, Catherine and Sophie have seen the fruits of their labour well and truly pay off. 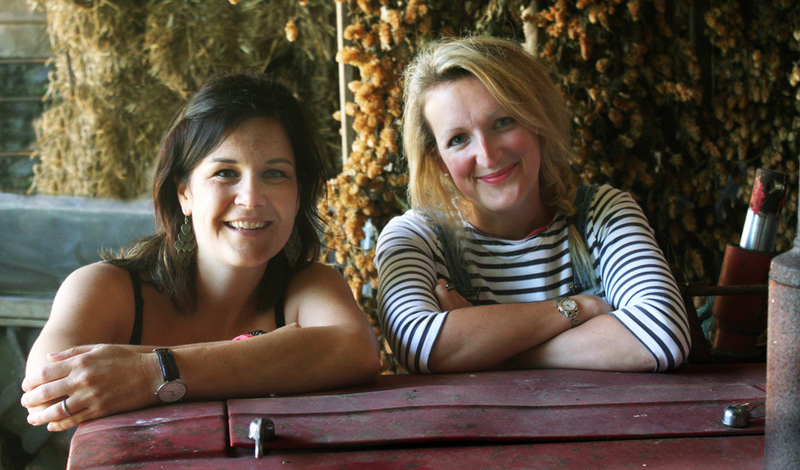 Just to have recognition from their own children is undoubtedly enough, but to receive such wonderful feedback from customers on social media brings its own sense of achievement, says Catherine – along with many farming bloggers writing reviews too. “Everything has happened so quickly but this is more than just a book. “It is amazing how the name, Farmer Christmas, catches on and I’d love it if the farm could become a sort of Farmer Christmas HQ – it could become an educational too. "Sophie and I are passionate about education because of having young children ourselves, so anything that could bring the magic of Farmer Christmas and the passion for learning about farming together would be incredible. It's so important for young people to learn about their food, where it comes from and how things grow. "I also think its great for children to learn about farming in other countries. I do like the idea of exploring other farming cultures through a story that maybe follows Farmer Christmas on his flight on Christmas Eve, delivering presents to children in far flung places, showing different farming practices around the world. “My kids Hamish and Digby and all the children that grow up on a farm are obsessed with that way of life. But it is that indescribable sparkle that takes over the little ones at this time of year that she wishes to truly capture and spread, recalling her own childhood growing up in a rural area. “The magic I felt at Christmas in the countryside, the book could give that to everybody. The sentiment that overrides this book is one of tradition. Although a new story, Catherine very much envisioned a modern tale finished with a traditional feel, with Sophie’s intricate illustrations bringing everything to life. “We wanted it to be a Julia Donaldson style story. The tale begins with three children who want to know what Santa looks like. Searching throughout the village of Baddelington, they look high and low for him and just as they are about to give up, Farmer Nick appears, donning his large beard, woolly red jumper and riding his red tractor. The book is endearingly charming – it’s homely and cosy. 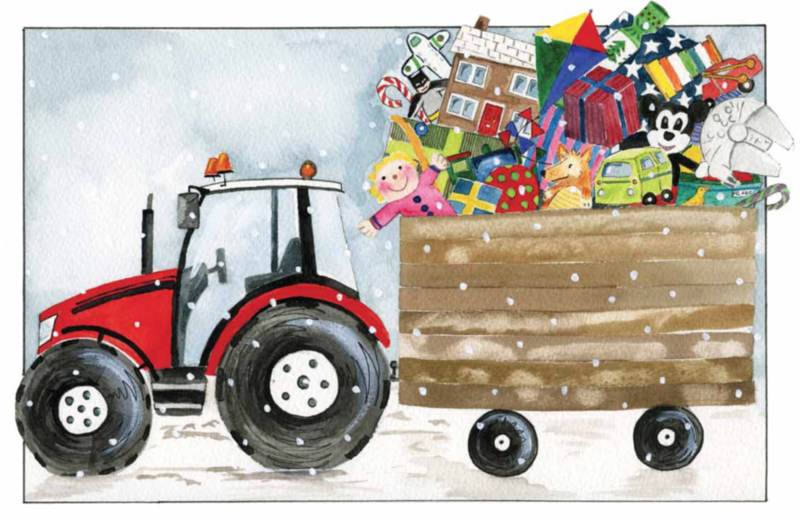 With a front cover that Catherine expressed her sincerest thanks to Sophie for, it encapsulates everything Farmer Christmas is about, as you witness the shadow of a tractor and trailer full of presents flying over the moon. With an additional Christmas Eve poem in the back, it is the perfect way to bring farming to your festive nights this winter. “Farmer Christmas is getting out of bed. “Puts on his wellies, gives his tummy a pat.